Well, it’s not technically FUDGE fudge. But it’s a fudge-like texture, and a delicious flavor. 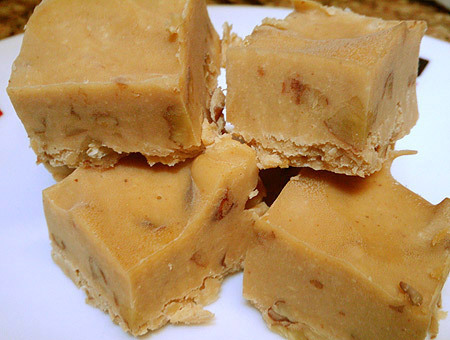 And so much easier to make than actual fudge. I didn’t even need a candy thermometer. I cobbled together a new recipe from some other low-carb recipes. The main thing I was looking for, besides a fudgey texture, was maple flavor. Which is one of my favorite flavors in the world. * I was supposed to use 2 oz., but I screwed up and only used one. Still tasty. ** One of the recipes I used as a base called for the whey powder. I had it on hand. I figured more protein was always welcome to the party. Toss the peanut butter and butter into a bowl and microwave for a minute. (I weighed the PB on the food scale, which is much easier than putting it in a measuring cup and then digging it back out.) Add the cream cheese, microwave for another minute. Stir. Add the syrup, whey powder, and Splenda. At this point, it’ll separate. Don’t panic! Whisk it for a minute, and it gets all thick and groovy. Add the pecans and stir them in. I put this into two little square plastic containers, lined with waxed paper, so it was about an inch thick. I tried just cooling it in the fridge, but it didn’t get firm enough. I think that’s because of the maple syrup (just today, I finally found “maple flavor extract” to use), so I tossed it into the freezer. That worked! Firm, but not TOO firm. Fudgey. Also, by replacing the maple-flavor sugar-free syrup with extract/flavor, I can get the sugar alcohols out of there. The syrup I have is mainly sorbitol, with a few other sweeteners, and some people react to sugar alcohols like sorbitol in an … explosive manner. If you know what I mean. So don’t eat too many pieces at once. I guess you don’t use half-n-half in your coffee, or you’d have found numerous stores that sell the (real) good stuff. What I don’t like about the fat-free is that it’s SWEETENED with corn syrup to make up for the fact that there’s practically no dairy in it! Yes, I say, skip the “fat-free” and buy REAL half-n-half, which as you know is just cream and milk. I made instant pudding the other day and subbed in 8 oz heavy whipping cream for milk and ended up having to add an extra 4 oz milk just to un-goo my blender! (Yes, I made INSTANT pudding in the blender – talk about lazy).. it was very much like mousse when all was said and done. mmmmmm…mousse. I use heavy cream in my chai tea. I don’t drink coffee (which is why they kicked me out of Seattle). Regular cream is hard enough to find in our local grocery! Usually there’s one single brand, in one single size. Then a couple of fat-free half-and-half, then a thousand cartons and bottles of milk. Maybe this is something I should sojourn to Whole Foods for; if I could find dairy from grass-fed cows, all the better. btw, sorry about the mis-placed comment – I thought I was attaching it to the ice cream post rather than fudge, but human error does still exist! Our nearest grocery stores are a Publix and the Super Target. Super Target especially has a cruddy dairy selection. I did manage to find one bottle of regular half-and-half today, not the fat-free crap. Although it still has carageenan in it. Why can’t it just be milk/cream? We do have Wal-Mart here, but none are particularly close to home. And the nearest one is an absolute madhouse no matter what time of day we go there. Doesn’t say how much maple extract to use? This recipe did not use extract — just maple syrup. I noted that I later found extract, and might experiment with it on a future batch.